An Attendance Allowance is one of the two main benefits available for disabled people. It is tax-free and is not means tested so that receiving it should not affect any other benefits that are available. If the person you are caring for is aged 65 or over and needs help with personal care or supervision they should be eligible to claim Attendance Allowance. 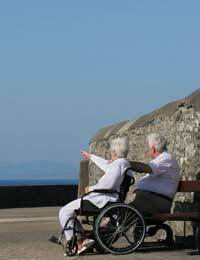 If they were already receiving Disability Living Allowance (DLA) before the age of 65, they may also be eligible for a mobility allowance in addition. Refer to the article on Disability Living Allowance for further information. Usually, the personal help or supervision will have been required for 6 months before Attendance Allowance can be received. However, if it is obvious that the person you are caring for will need help for more than 6 months, it is worth applying for it in advance so that it will be paid as soon as the 6 months are up. If the person you are caring for has been diagnosed with a terminal illness, it can be claimed immediately and will be paid at the higher rate until the end of their life. The lower rate is £43.15 per week and the higher rate is £64.50. These rates are applicable for the year to April 2008. The Government usually announces any planned increases in benefits during December each year. To qualify for the lower rate, the person you are caring for needs to require frequent help either during the day or during the night. To qualify for the higher rate, the person you are caring for needs to require frequent help during the day AND during the night. Need continual supervision throughout the day to avoid substantial danger to themselves or others. Need another person to be awake for a prolonged period or at frequent intervals for the purpose of supervision to avoid substantial danger to themselves or others. What do these Conditions mean in Practice? ‘Frequent’ and ‘repeated’ means several times a day or night, not just first thing in the morning and last thing at night. ‘Attention’ usually means hands-on help as when you dress, feed, bathe or toilet your loved one. ‘Bodily functions’ include eating, drinking, hearing, seeing, going to the toilet, getting dressed and bathed. It can also mean walking or being helped with mobility as with pushing a wheelchair. ‘Supervision’ may be required for someone with dementia or other serious cognitive problems. How is an Attendance Allowance Claimed? For an application pack, ring the free Benefits Enquiry Line (BEL) on 0800 882200 or textphone 0800 243355. Alternatively a pack can be collected from your local Jobcentre Plus or social security office, or visit the website. The pack explains how the claim will be assessed. If you have a problem filling in the form, ask your local Citizen Advice Bureau for help.